Residents in the Portland area have a fun way to help Make-A-Wish Oregon grant more wishes this spring. The annual Walk For Wishes takes place Saturday, April 16. 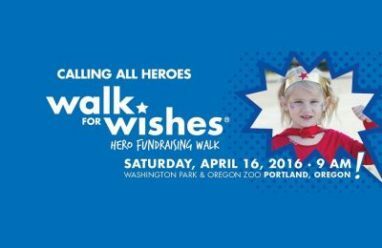 Be a hero for Wish Kids and help Make-A-Wish Oregon reach their fundraising goal of $150,000 at this year’s walk. Just think of all the wishes that amount can grant! Everyone who comes out to the Walk For Wishes is a hero for local Wish Kids. Participants are encouraged to dress the part this year by coming in their favorite superhero costume. On-site registration starts at 7:30 a.m., followed by opening ceremonies and the walk at 9. The walk begins at Parking Lot A by the Portland Children’s Museum (4001 Southwest Canyon Road). From there, the 2-mile route winds through the Oregon Zoo and goes past the Vietnam Memorial before ending at the same parking lot. Stick around after the walk for activities the whole family will love. Online registration is open now on the event website. Standard registration is just $10 for all ages and Wish Kids can attend for free. Fundraising is also encouraged for all participants. Those who raise $50 will receive an event t-shirt, and if you raise $100 you’ll receive a t-shirt and free entry to the Oregon Zoo after the event is over. Higher fundraising incentives include a Walk For Wishes drawstring backpack, a Camelback water bottle, and a Fitbit Flex. If you’re among the top fundraisers at the event, you may even be eligible to win a grand prize. The top fundraising individual will receive two roundtrip Alaska Airlines tickets to anywhere the carrier flies. The top fundraising Wish Kid will receive the same airline ticket package and a pair of one-day Disneyland Park Hopper Passes. The team that raises the most will win a Buffalo Wild Wings party. Finally, the top corporate team will get a trophy as well as an ice cream party with a special Wish Kid visitor. Those who can’t attend can still make the walk a success by helping another participant reach their fundraising goal. Simply look up a participant here to make a contribution. You can also promote the event on social media with #WalkForWishesOR. More than 200 Oregon kids are on the waiting list to have their wish come true. Attending events like the Walk For Wishes is a great way to help Make-A-Wish reach every kid with a critical illness in Oregon. You can also help make wishes come true by donating your car to Wheels For Wishes, benefiting Make-A-Wish Oregon. Wheels For Wishes is a tax-deductible car donation program that accepts nearly all vehicles and offers free towing. Best of all, your donation helps Make-A-Wish Oregon grant wishes for children with critical illnesses. Donate your car today using our online car donation form or by calling 1-877-431-9474.